My dentist referred me to an endodontist (root canal specialist) for an apicoectomy procedure. Could you please explain what this is and what it entails? If your dentist is recommending an apicoectomy, it means that your tooth cannot be successfully treated with conventional root canal treatment (which will be described below). An apicoectomy is a minor surgical procedure in which the very tip of the tooth’s root is removed (“apico” – apex or end; “ectomy” – removal) and sealed. It is usually performed by an endodontist (“endo” – inside; “dont” – tooth), a dentist who specializes in the diagnosis and treatment of tooth pain from root canal disease. As the illustration on this page shows, a space inside the tooth called the pulp chamber houses the pulp — the living tissue (nerves, blood vessels and connective tissues) that keeps the tooth alive. A root canal system branches from this chamber. Endodontic treatment, commonly known as root canal treatment, is needed when the pulp becomes inflamed or infected. This can happen for several reasons: deep tooth decay; repeated dental procedures to a tooth (replacing a large filling, for example); or traumatic damage such as a crack, chip or even a fracture. If the pulp dies, the pulp chamber and canals can become infected. That infection can eventually spread into the surrounding bone and other tissues around the tip of the root. Endodontists use radiographs (x-rays), or sometimes CBCT scans (cone beam-computed tomography) that create three-dimensional views, to examine root canals and diagnose disease that might otherwise go undetected. Previous root canal treatment can become reinfected for a variety of reasons. 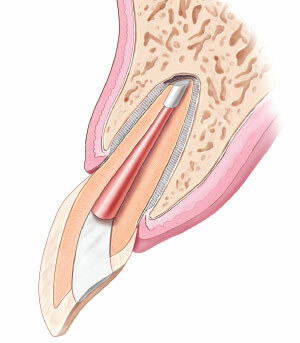 If conventionaal root canal therapy is not possible, an apicoectomy is an option to save the tooth. A small incision is made in the gum tissues at the level of the infection allowing the infection and root tip to be removed. Conventional root canal treatment involves drilling a small access hole into the pulp chamber through the biting surface of a back tooth, or from behind a front tooth. Inflamed or infected tissue is removed from the pulp chamber and root canals, and the space is disinfected, shaped with tiny flexible instruments, filled, and sealed. A temporary or permanent filling material will then be placed to cover the access hole. A permanent cap (crown) is often used to replace lost tooth structure and to protect the tooth from biting stresses and further damage. As you can see, a lot of work goes into treating root canal infection. But root canals may become re-infected for a variety of reasons: new or recurrent decay; previously undetected accessory (extra) canals branching from the primary canal at the root end of the tooth; and, occasionally, calcification (narrowing and hardening) of canals — a reaction to trauma or aging that can block the canals and prevent them from being fully cleaned by conventional root canal treatment. Sometimes, conventional root canal retreatment may not be feasible, or may even jeopardize the tooth. For example, accessing the canals of a tooth that has a crown and a post in place may require taking apart the entire restoration, which could further weaken the tooth. In such cases, a better alternative is to treat infection from the root end of the tooth (instead of the crown end) with an apicoectomy. 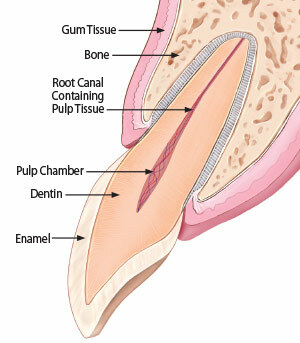 A small filling is placed at the end of the root canal to seal the canal and prevent further infection. A stitch is placed to close the gum tissue. The area heals with new bone formation and returns to normal function. 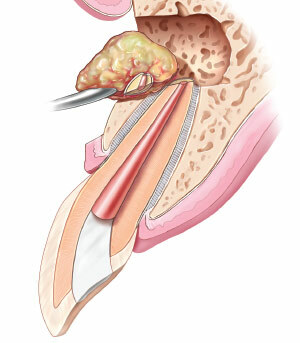 Unlike traditional root canal treatment, an apicoectomy is a surgical approach through the gum. After the area is thoroughly numbed with local anesthesia, a small incision is made through the gum tissues at the level of the affected root, permitting direct access to the infected peri-apical tissues (“peri” – around; “apex” – root end). This allows removal of any inflamed or infected tissue near or around the tip of the root — along with a few millimeters of the root tip itself. 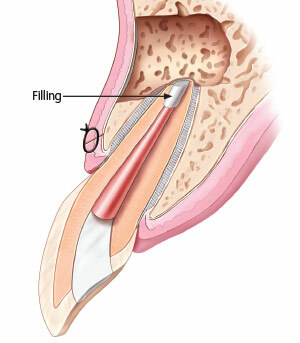 A very small filling is then placed in the end of the root canal to seal the canal and prevent further infection. Afterward, a few sutures (stitches) are placed to assure that the gum tissues are closed and will heal properly. Where necessary, bone grafting or other techniques are used to help the bone to grow and fill back in, particularly if infection has left a significant void. Over time, the absence of infection will allow the area to heal and return to normal function. Endodontists use state-of-the-art technology such as fiber optic lights, operating microscopes, and ultrasonic instruments that clean via high frequency vibration, when performing endodontic surgery. These advanced technologies give endodontists a very accurate view of the tooth, making the treatment quick, comfortable and successful. While only performed when conventional root canal retreatment is not practical, apicoectomy for failing root canal-treated teeth can save them, returning the tooth, bone and gum tissues to health for many years.